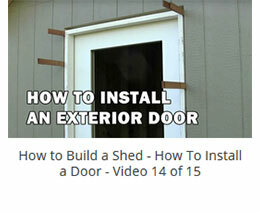 Learn To Build Any Project With Our 15 Free DIY Shed Building Videos! 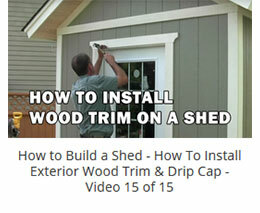 These videos cover every aspect of construction from ground preparation right through to the final installation of trim. Overall, there is about 6 hours of video and they are all free to watch. Want To Start Building This Shed? Hi Henry. Thanks for the great set of plans and videos! I was wondering what you would recommend for a border between the gravel foundation and the rest of the yard. How far out beyond the base of the shed should the gravel foundation go? We used wood landscape ties as a border/separation between the gravel and lawn. For the shed in the videos, we went out a long ways on the left side and about 24″ on the other side, back and front. Why 24″? So rain coming off the roof would not ruin the lawn and wear away the soil – it drips onto the gravel. On the left side, we wanted a clean look and place to store garden stuff that did not need to be in the shed (and no lawn to cut) so we went right to the fence with the gravel. All that said, I feel 24″ makes for a good distance around the shed – both for appearance and rain run-off (minimize erosion). Your shed building series was absolutely perfect! Took all the guess work out and it was so much fun building the shed over the summer. I am now contemplating an extension to my house but have not come across any good resources. Wondering if you could steer me in the right direction on this and if you could point me to some resources that are as clear and informative as the shed building series. Hi Keith… Glad you like the series. A home addition is substantially different than how one builds a shed and there is much to know as i am sure you are aware. I would highly recommend sourcing out reputable contractors with projects on the go and simply ask if you can observe their projects, query them when possible for things you are not sure about. Being local, they likely will know local codes and building to these standards. While some contractors may not give you the time of day, others might share lots of information – check around. Online, check the reputable sources backed by big names (magazines, product manufacturers etc) for different stages of construction. These companies are less likely to post incorrect information as their brand or name is on the line. my name is Roy Uiterwaal and i live in the Netherlands (Europe). I’m building a blockhouse and i have been watching your video on how to install roofing shingles. It was most helpfull and i learned a lott of all your tips and tricks. I thank you for that . I have just finished the roof today and i’m very proud of the result. Good luck with all your further projects. Hi Roy… glad you liked the videos and that it worked out great for your roof. More videos are coming soon – just have to do some post editing. 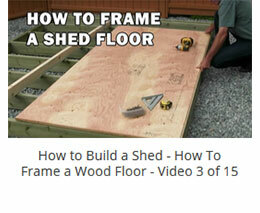 I’m so glad I came across you video series on sheds. I never thought of reducing the footprint by 3″ all the way around. At first I was scratching my head, and then I realized that when you add 1/2″ OSB siding, and then your finished siding, your dimensions will be 1.5″ to 3″ larger depending on the finished siding thickness. 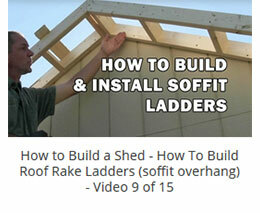 I’m building a 10′ x 16′ shed, with a transom dormer and while it’s not the same as this one, I’m looking forward to watching all the videos (likely multiple times) to pick up any tips, like this one, that I can. If I have questions, hopefully you can help me out. PS. I agree with your concept of building stronger. I’m not planning on ripping this shed down and redoing in the next 30 years, so it better last a long, long time. Overall the reduced footprint is most ideal for sheds up to 10 x 12, once you exceed that size, the savings on materials becomes less relevant. For example, at 16′ long, you will probably use more that one length of lumber for skirting, upper trim, fascia boards and so on – so the benefit of the reduced length is minimal. For a larger shed with sheathing on the walls I would probably stick to the full length as it will work out best with floor and wall sheathing, stud spacing etc. Success on your shed build! Henry, your video series was fantastic. The finished shed looks beautiful and your explanation along the way was clear and comprehensive. Really well done and I appreciate it. Which makes me eager to see what additional projects and plans you have. You mentioned somewhere plans for a chicken coop and a green house. Any idea when you might post those plans/videos? Glad you like the videos. We are planning on a greenhouse video (an inexpensive easy to build one) after the current project… and a chicken coop mid summer. 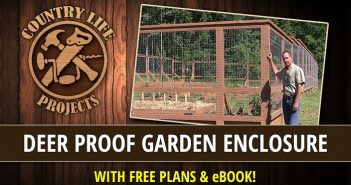 Right now priority has changed the order of videos and we are filming a garden enclosure that is 7 1/2 feet high and will (hopefully) keep out deer, bear, gophers, rabbits etc – without having to pound or cement posts into the ground. 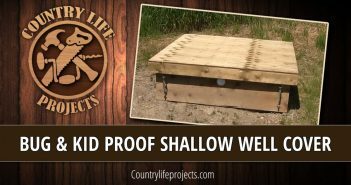 We also just finished a shallow well cover that keeps out even the tiniest of insects. We also had to cut glass and make a foldup sawhorse – so we did a few quick videos on those too – should be posted very soon on our YouTube channel. Henry, I’m building a 12’x20′ shed and have already built and installed my trusses according to your video instructions 24 in. centers with that making a total of 11 trusses from front to back, I used your jig plan for these trusses and since my building is 12 ft. will my trusses be alright and strong enough for the length and width differences of our two different applications? It is hard to say if the trusses you are building are strong enough without seeing them. However, if I was spanning 12′ with homemade trusses I would use 2×6 for the bottom chord (partly for strength but 2×6 also allows for storage in the attic area of heavier items) and 1/2″ plywood for the gussets (and increase the size of the peak gusset to 48″ wide). This might be a touch overkill but since I am not an engineer, I like to build a little stronger than I suspect is needed. You’ll need to make the call on whether you feel these are strong enough for the area you live (snow load is one the most important considerations). All that said, for anyone reading this reply, if you are not sure what is required for the climate and building codes in your area, order pre-fab trusses, they are cheap and will be engineered for local codes and climate. One more thing… at 12′ x 20′ I would assume you would need a building permit for this size of shed? If so, and you want to be 100% sure before you proceed, ask your local building inspector if he approves of the trusses. If he/she does, then I would think they should be fine. Lastly, I like using homemade trusses for 8′ and 10′ widths. At 12′ maybe, but other alternatives may allow for better use of the attic space, especially if the roof pitch is increased. A lot depends on the intended use, design and budget. I Henry. 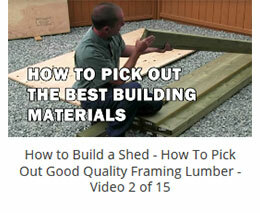 I’ve been thinking of building a shed and came across your excellent videos while doing online research for plans and construction techniques. 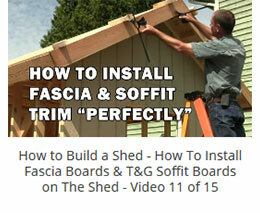 I love the design and architectural details of the shed in the video, and your tips and jigs/blocking for doing solo construction are just outstanding. As much as we like to sell plans, I can’t say they will help much other than to serve as guide. That is a lot of changes and you would be just as well to use the videos and work out the sizes to suit your needs. 2×6’s for bottom chords is a must for storage. For the door on the side, be sure to use the header detail as per the front door in the videos (side walls are bearing – we only used it on the front wall to show how to do it). With a 12/12 pitch, make sure the overhang/soffit does not interfere with doors opening if they open outwards. Lots of heat and humidity? > be sure to add venting, either on the front and back as gable vents, or soffit and ridge venting. 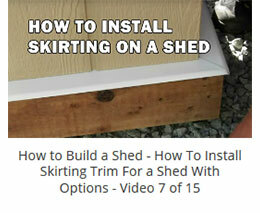 Hope that helps and success with your shed build. Hi Henry, thanks for your great videos. I’m debating whether to buy or build a shed and your vids give me confidence to give it a try. In determining which way to go I’m wondering if I could get the approximate cost of the shed materials? I haven’t watched all of the videos so I apologize if it’s been covered there. In BC Canada, the cost of the shed was about $2100 Cdn. This was using the best materials we could get… so it is likely that the cost would be lower if you can get good deals on materials as well as the price of materials in your location. Videos are fantastic. Will be starting my shed soon. What type of drill do you use in the videos? I know it is a DeWalt. When you start driving is sounds like a regular drill but once some resistance is met it sounds more like a impact wrench. It is an impact driver by dewalt – 18 volt. Now you can get 20 volt. However, I am leaning more toward to HD Makita line of impact drivers these days. Your shed videos are great. I am planning on building my first shed in my yard. I have been looking all over the Internet at videos and pictures and I really like your design. I do have one question about your design. Your plans so far are the only ones that I have seen that does not have your floor frame on skid/runners. I also would prefer to not have skids/ runners because I don’t want critters [ skunks, snakes, black widows etc…] hiding under the shed. However it as been mentioned by others that you need air flow under the shed because of moisture. What is you opinion on that? 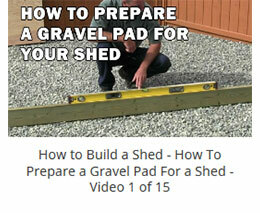 There are few things to consider when placing the shed floor frame on gravel like we did. In our case, a prior shed was in its place and buried 3″ into soil with pressure treated 4×4 frame – when we demolished it, the bottom of the walls were rotten but the floor frame was still in good condition – it was over 20 years old so we summarized that a pressure treated frame on 3″ of gravel with good soil drainage would suffice for another 20 or more years. And like yourself, we did not want rodents setting up house under the shed. That said, we used 3/4″ gravel to make sure some air could pass through the stone, not a lot, but we felt it was enough to let moisture escape in dry weather. We also made sure the soil under the gravel sloped away and drained to the far back corner so any water passing through the stones would not pool under the shed. We used pressure treated lumber for the frame just in case. I doubt if 3/4″ gravel will keep spiders out, but it should help keep rodents out. Based on the life span of the previous shed, we feel this new shed design on the gravel base should be good for at least another 20+ years. Skids are a good idea on ground the does not drain well in areas with high water tables. After 2 1/2 years since we built the shed, there is no signs any moisture issues on the 2×6 base or odours such as moldy or musky smells. It does get a little warm in the summer and Mark is considering the addition of gable vents on the front and back of the shed (a good idea for areas with hot and/or humid weather too). Outstanding 16 step video. I would like to know if you have plans I can purchase for a 12′ x 16′ shed same as the type in the video. This will be my first time building a SHED . Glad you liked the videos! Right now we only have plans for the 8 x 10. Sorry about that. Hi Dennis… Sorry we just have the one design. This is a very nice shed and very well built. Incredible videos and attention to detail. I am an advanced DIY’er and do most of my projects by myself. It’s awesome to see all of the tricks to assist when doing that. I have done some framing but never built a shed or layed out a design that large. Is there anyway I could get you guys to alter your plans for a 12 X 12 shed. I also plan on building or buying 60-64″ double door opening. Henry was smart on thinking of slightly reducing size by a few inches to save material. I would have a difficult time doing that probably. Altering the roof trusses would probably be harder as well. The walls and foundation would be easy enough. The roof pitch and space that would create is great. The overhang of the roof looks great. If not, thanks for what you’ve put out there anyway. I’ve watched all 15 videos and this is the most comprehensive step by step build of anything I’ve ever seen. Again fantastic job to Henry and anyone else involved in the building or planning of this project. Great to watch a solid carpenter and learn from his experience. Hi Henry, I bought your plans and then modified them (I’m a CAD guy) for a 10′ x 12′ (maximum size in my city without a permit). I think the videos and the instructions are fantastic. However, there is one part that I am not clear on – it is the step that I am ready for now. In video 6, installing the trusses, it all makes perfect sense except where you say to attach them at the bottom (on the top plate). I see the front and rear attache to the top plate with the blocking. I am confused by the middle trusses. I see at the end of the video, that you attach the bottoms with the hurricane straps, but what about prior to that? Do you just toenail them in to help keep them located correctly? Thanks for the great work on this! Sorry about that and by the way, thank you for buying the plans. We lost some footage at this stage of construction and did our best to make that video complete. That said, it is easy, just use nails or screws and fasten through the bottom chord into the top plate of the wall diagonally on both side (toenailed) – repeat on the other end of the truss. In total, you should have 4 screws or nails holding each truss to the top plate of the wall. Minimum length for nails or screws should be 2.5″ to 3″. So you are correct, toenailing is standard for fastening to the wall plate. The hurricane ties make sure the trusses won’t lift in high winds. Best regards and success on your shed. Hi Henry, can you tell me the paint color/ manufacturer that was used for the paint on the walls of the shed, also was it a satin finish? I assume the white trim was a gloss finish. We used Behr from Home Depot. The walls are satin (almost flat) and the trim was semi-gloss, not high gloss. But any good quality paint will do. 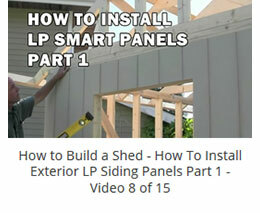 Hi Henry,Thank you for putting up such fantastic videos for your shed,the plans of which I have purchased and have just started building.As I live in the UK,I have a real problem trying to source the LP SmartPanels and have found a company in England who will supply them,however,they are very expensive here(as are most of the materials here) and the overall cost to build must be nearly double what it is in the US.What would your best alternative sheathing(or cladding as we call it here) be?I was thinking of T&G shiplap boards but would it be ok to use plyboard similar to what you used for the flooring,but obviously thinner?Incidentally,you cannot buy T&G plyboard at 4’x8′ in this country either,so I had to use normal plyboard for the flooring,but I managed ok.I only have the floor finished at present as I am trying to source some windows to incorporate into my design,but again they are so expensive here-around £300 per window!I would appreciate any tips or advice you could give me and I thank you for all your informative tips and I look forward to completing this project.All the best,Colin. First, thank you for purchasing the plans… I am surprised considering you live in the UK (and I have heard wood building materials can be much more expensive there). I know when I lived in Amsterdam, wood was always an expensive option. Not knowing exactly what you have available I can only recommend what I think may be less expensive alternatives. If plywood sheathing is reasonable, I would use this for the exterior first. Then you can source out a finishing material other than wood that may be more affordable (e.g. vinyl siding or similar materials). In regards to windows, have you checked to see if suppliers have economy windows made specifically for sheds or summer cottages (the small type of cottages common in Europe), or is it possible to order online from a source in Europe that “might” offer cheaper windows (provided shipping is reasonable?). Now if you use plywood sheathing, you need to consider a house wrap of some sort to go under the finished exterior product (I am not sure what is available over there – here we use Tyvek house wrap, or similar brand name). Do keep in mind, if you go with the plywood sheathing, it likely will change the exterior finishing… subject to what you use (at least I think it will be different from what I show in my videos). For trim and soffit materials you could go composites (vinyl, concrete based, OSB Trim – specially made pre-finished trim made under high pressure with resin glues etc). You can’t go wrong with HardiePlank but you should use a sheathing underneath. Looking at building the 8X10 shed and everything looks great with the plans, I’m going with the ridge vent along with the soffit vent. Which would you recommend, vinyl or wood ? Sorry for the delay… been very busy. I am not sure if you are referring to the vent strip, or the entire soffit/overhang area. If just the vent strip, I would go with a continous 2″ vinyl vent in the soffit along both sides of the shed soffit. I have not seen wood for this application in my area. I think your videos are great. Easy to follow with lots of tips, especially on how to build yourself using braces and jigs. The end result looks fantastic. I was never any good when it came to the finishing touches, i.e., trim etc but your video makes me think it’s possible for me to build a similar looking shed because you explain things really well in your videos. The shed I would like to build will be 8X12. Do you have any suggestion on what size should I cut the framing members in order to reduce waste. Your floor frame measurement was 7’9″ X 9’9″. Should mine be 7’9″ x 12′? Glad you like the videos… Your length should be 11′ 9″ – this will save on the finishing materials in the later stages of the shed project. Hi Henry, Thanks for the videos. Built a 10 x12 shed using your videos and it turned out great. Many compliments from neighbours and friends. Just wondering if it would be necessary to install a vent. if you live in a dry area it shouldn’t be an issue. However, if you live in a hotter humid climate venting is a good idea. In addition, if you insulate the shed it would be a good idea as well (gable vents on both ends should be enough. We left it out since many DIY sheds at HD etc do not have venting. For anyone who hasn’t started their shed, soffit venting with a ridge vent or roof vent is optimal but much more time consuming and costly. I would love to see you do a gambrel style roof. I love your series of videos and feel very confident to build a shed for my brother next month. we are going to use a gambrel style roof for extra loft storage. Thanks again for the great videos. Nice videos! I’ve watched them all and learned a great deal. I’m not an experienced framer but your videos give me more confidence to undertake a shed building project. I’d like to build a 10′ x 12′ shed. Are the ebook plans readily adaptable to different dimensions? As far as the plans go, I wouldn’t say they are readily adaptable. You would have to make adjustments for the increased size and double check things as you go. I would say they would make a good guide, but you would still have to make lots of changes to measurements for each stage of construction. Henry, first thanks for your shed videos , they’ve helped a lot. I’m building a similar shed with the same basic design but I’ve run into a little problem that I’m hoping you can give some advice on. Because of a zoning height limitation of 10’ in my area and making sure I could get the door under the eaves, I had to change the roof slope to 22.5 deg from the 30 deg in your video’s. The slope change shortens the ladder lengths. When I went to put the 6” (act 5-1/4”) X 10-3/4” T&G slates on the underside of the ladders I wound up with a 1/2”-3/4” gap between the last slats at the peak where the two ladders meet; too large to ignore (aka caulk) and too small to modify a slat to fit as you show in the video. My thought was to go ahead and put the last slats up there; then cover the gap with a 2” (approx.) wide slat with the 10-3/4” sides cut at 22.5 deg angle so that it would straddle both ladders at the peak. Will that work? ; do you have any other suggestions for this issue? For the record I’m building an 8’ (7’-9”) by 12’ shed with a nice door, similar to the shed you built in the videos, I’ve added two windows (3’ X 2’). I’m getting ready to shingle the roof I’ve got the 30# felt down (it rained of course). I’m somewhere between the end of video 11 and the start of video 12. Generally it’s coming out pretty well, amazingly so, because my carpentry talents at the start of the effort were limited to reliably hitting any given nail 90% of the time. Just a few experiences from an amateur to mention for anyone that’s planning to build one; I’ve yet to find a dry, straight, square lumber that is dry and free of knots; if the stuff actually exists it must be located in the unicorn section of your Home Depot. I’ve gotten to like those hand clamps, more of them is better and they’re really cheap at Harbor Freight. I gave up on the recommended 3” Phillips head construction screws and went exclusively to the coated ones with the star heads on them; my impact driver was tearing up the up heads on the Phillips screws. If you send me an email address I’ll send some pictures. Thanks again, your videos were terrific, and if you can tell me where you found that straight, square lumber with no knots I’d be really grateful. Can you send me a pic of the problem section and I would be able to get a better idea of your problem (use our contact form and I will send you an email address to send to). And yes, I would love to see pics of the finished shed… it is always great to see how projects turn out based on the information I have posted in our Youtube videos. Thanks for the awesome instructions in the videos and the plans. 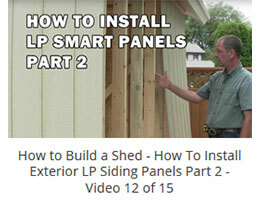 I purchased and downloaded the plans and material list and build my shed per your instructions. The end products is quite stunning. I am getting great feedback and compliments from my neighbors and friends. Just wanted to thank you for these great instructions, detailed plan and complete material list. I wanted the inside to be really bright so I could use the shed for potting and nursing in early spring so I added 2 windows on the short sides and on the long and this also worked really great. First off, I love your videos. I have watched the whole series at least 3 times and have referenced through out our plan design. We are building a 10’x10′ storage shed which will have a front door, a 36″x24″ window on one side and a roll-up door in the back. 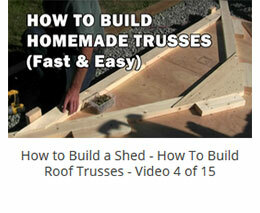 I have two questions which I’ll reference video 6 – installing the trusses. 1. How did you secure the trusses to the frame? 2. How did you secure the gable end studs? Those two things I did not see in the video. Once again, great videos and I reference your plans often. Glad you like the videos and find them helpful. The trusses are attached by screwing or nailing on an angle into the top plate of the wall (2 per side – total 4 – one from each side of the truss). In addition, I highly recommend hurricane anchors (the type that is mounted on on side of the truss – not the diamond shape as they don’t fit in this design). The gable trusses are secured along the length of the bottom chord into the top plate and 2×4 backing behind the trusses, which is secured to the top plate. The gable end studs – just toe nail into the truss rafter and bottom chord with nails or screws. The center stud at the top can be secured by screwing through the plywood gusset of the truss into the stud (from inside). Thanks again Henry! My reply didn’t go through earlier it seems. I will remove the H clips and go with some blocking arrangement. Great idea! My trusses are 16″OC and whereas your are 24″ I wasn’t sure if there was a code issue involved with using the H clips. If you build a gambrel roof we will have to invent the suitable H clips ! All the best and thanks for your comments. 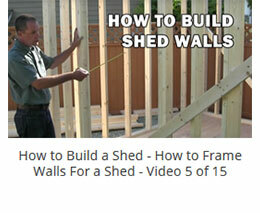 Great videos (How To Build a Dream Shed – 15 Video Series) Henry !! Very helpful and full of handy time saving tips! I’m really glad I found your site. I’m in the process of building an 8 x 12 shed with a gambrel roof. Yesterday the 1/2″ plywood went on the trusses. I did install the H-clips but with the angle from surface to surface it was a fight of “persuasion” with the hammer to get the clips to co-operate. I’m a bit concerned that if the sides of clips are not perfectly flat with the surface which they clip on to, that I will have trouble with the roofing shingles not laying flat as well – as the clips may lift the shingles. Today I finished installing the LP Smartside panels and routered the door opening and ends with a Lee Valley flush trim bit. It sure beats “marking and sawing”. Just wondering about the H-clips and wanted to say how valuable your videos have been to my project. Glad you like the videos. It sounds like you do not have the correct H-Clips for the thickness of plywood. They should just slide onto the edge of plywood with very little resistance. A hammer involved tells me they are for thinner material. And yes, if the tabs are bent upwards, they will likely cause problems with the building felt/paper and the shingles, possibly causing leaks if the tabs poke through the roofing material (depending on how bad they are bent up – but they should be flat on the plywood and not bent at all). Thanks for your speedy reply Henry ! Yes my concern is for the felt and roofing material being damaged by the clips if not flush with the plywood. I do have 1/2 ” plywood and 1/2″ clips. The problem stems from my roof being of the gambrel design. The cross-sectional view of the roof would show the roof panels forming a 135° angle where they meet. I guess my question should have been … are there H clips available being designed for other than a roof where meeting panels line up in the same plane and thus meet with an 180°. The reason for the persuasion of the hammered nature was to bend the clips flush with the plywood. But speaking of roofing materials …… do un-used roofing shingles have a “shelf life”? I have enough asphalt shingles left over from re-roofing my house which I intend to use to shingle the shed. But I wonder if they may have gone brittle. They have been stored in my basement. Sorry Mike, I did not catch the fact you were talking about gambrel design. I thought it was the same as our shed design. To my knowledge, there is no way to use H-Clip where the plywood edges meet at the angles. As long as your plywood fits well, I don’t think you have to do anything further – although if it was me, I would make sure to start at the bottom row, and on the angles, to let the next rows edge sit on the top edge of the prior row – this means cutting the top edge of the first row at the correct angle and the bottom edge of the second row as well – the peak of the roof would be butted together. It all depends on how fussy you want to be. 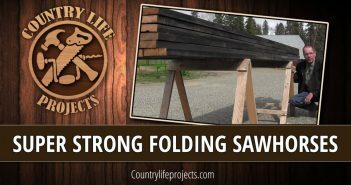 If it was my own shed, I would use 2×4 blocking with one edge cut to match the angle and I would put these in place as I completed each row – you likely won’t see that done very often though. I can’t see any problem using leftover roofing as long as it is in good condition. Not sure about a shelf life. If they are brittle and cracking, I would not use them myself. Henry – I have no construction experience and have been looking for a quality ‘how to’. I’m very excited to have found your videos and ebook. I will be putting the door along the long wall in the middle. I want to add a covered deck along the same wall (with the door), but have no clue how to go about it. Could you please provide some guidance – I would gladly pay for any plans that would depict this. Sorry, but what you are asking is a lot of work, I make the plans manually for each project (after I have built the project so I know they are bang on). E.g. the shed plans for one shed size is about 10 days work from concept to final plans – checked and double checked. I finished my shed last week (10×12) following your plans as closely as possible, considering that some changes had to be made for the size increase. This was my first construction project other that a deck I built over 20 years ago. I couldn’t happier. I had nieghbors with construction experience make a note of the finer details express some surprise that I was able to do this with almost no experience. I made a few changes I hope I don’t regret. I built the floor on skids (with a layer of gravel under the skids). Also, I could not find tongue and groove plywood locally, so I went with t&g osb (3/4″). But, that gave me an excuse to top the floor with garage tiles. This was actually a nice upgrade. I also built the door following some plans on a different internet site. I may have framed the opening a little bigger than I should have for this type of door, and it turned out a bit heavy. To compensate, I hung it with some very heavy duty stainless 10″ T hinges. These were by far the best, most detailed videos and plans I was able to fine anywhere on the internet. I plan to buy another set of plans as a thank you for providing that many detailed videos free of charge. I encourage anyone that builds this shed to at least buy the plans and give a little back to Country Life Projects. I do IT (including some web) development for a living and can appreciate the amount of work that went into the project and the site. I would be glad to email the pictures to you if you would like. Thank you for compliments and glad to hear things worked out very well for you. The videos did take lots of work and money, but it was worth taking the extra time and include the details. It has been a while since we last posted a project, but very soon we will be doing more… it will be on building your own kitchen cabinets and everything involved (and you won’t need fancy tools to get professional results). When the final videos are done, we will have a very extensive plan package for all sizes and types of kitchen cabinets (that part may still be 2 to 3 months away). We are actually planning to add a section to our website for anyone who has built a shed (and future projects) with a form to upload pics and comments – working on it, not sure how long before it is ready. In the meantime, I will send you my email address privately so you can email your pics – would love to see them. Hi Henry great video I’m thinking of building a 10×10 shed would that produce much waste of materials. Glad you like the video. If you build in the same manner whereby the actual base (floor framing) is 9’9″ x 9’9″ you will save on materials, you have to figure out the differences for the width though. Our design is based on 8′ wide (7’9″). Overall, the larger the shed is, the less savings there are versus total cost. we designed our shed to save on materials, but also to reduce waste (a shame to have a bunch of short pieces left over that have little use other than firewood – an expensive fire that is). Henry, thanks so much for the shed videos. I’ve watched a great deal of woodworking videos; these are by far the best I’ve watched. Wondering when the chicken coop videos might be coming out? Glad you like the videos… With winter coming (well here already where I live) it will be in the spring/summer 2015 (we have to buy a property first). This year has been so busy it has been hard to do more video, but later this winter and next year we plan to do a lot of videos. We are hoping to do a complete series of DIY kitchen cabinets (winter project), tool use videos and woodworking techniques. In the spring, we plan to buy land and then start a series of videos as we develop the land, build a house (to be on video too) and then all the outbuildings – in all it is likely going to be 2 to 3 years of constant videos. Thanks for the speedy reply and all your generous hard work. I’ll look forward to any videos you’re willing to post. Hi Henry, I am Arby, the guy that asked about trusses and was building the largest shed I have ever done. It’s an 11′ x 14′. I went with 2×6 cords and 2×4 rafters or rakes. I used 3/4″ plywood for gussets and also put in extra braces like engineered trusses would have. I also put them on 16″ centers and they are very strong. I’ve been taking pictures from start to finish and have used many of your tips since I’m building it myself. Just about finished and will post a video and give full credit to your site for all the tips and help it has done for me. Sorry I didn’t buy your plans, I have drafting skills and always draw my own plans and material list. It’s turning out great! The 11′ x 14′ really save on material waste just like your 8′ x 10 which you downsized a bit to save material. Thanks again for all the help the videos did for me! That is really cool and glad our videos helped that much!… sounds like you built your shed to withstand anything nature could throw at it. Looking forward to seeing the video. Please let me know when it is up and I will post it on Countrylifeprojects.com as well – we are planning to change the site a bit and add a section where visitors can upload images/text for projects they have done. Please Don’t apologize for not buying the plans, it’s great that you were able to design your own shed and use our videos to make it turn out the way you hoped! Thanks so much for the great and informative videos. You have a gift for explaining things in a more understandable way than any I have seen out there. I just have one question right now and it seems obvious but I want to be sure. The large gravel foundation: can it be used in areas where subzero temperatures and deep snow are experienced? I live in an area like this so I understand the concern. Basically, sheds are built on skids, blocks or in our case a gravel base. All of these methods will be subject to frost heave. In my opinion, the even gravel base is the best, the ground will heave and settle evenly. So, IMO, there should be no concern building on gravel in such an area. The only thing that may change this is if you are installing underground wiring to the shed, then you would have to make sure frost heave will not stress the wiring where it enters the shed. Thank you for sharing this video. It has to be the best I’ve seen in this category. I’m thinking of building a 10 by 15 shed. Do you think it may be necessary to go with 2 X 6 walls and trusses or just rafters….Thank you for your reply. For a 10′ span, 2 x 4 should be fine for everything. However, for the truss gussets, I would upgrade to 1/2″ plywood. Also make sure all your rafters are free of large knots as they weaken the wood. If you are dealing with very heavy snow loads you may wish to upgrade the rafters to 2×6 but the walls will be fine using 2×4’s. How tall is this shed? Ground to peak of roof. The shed is 11′ 1/2″ from bottom of the joists to the peak of the roof. We are actually planning to purchase a rural/remote property and start with a small self contained cottage, then a house and many types of outbuildings – as well as solar, rain water collection, permaculture and gardening related videos. Not sure what the timeline for this is yet (still have to find a cheap property etc). What size did you have in mind? I am currently working on a set of plans for a 14′ x 36′ cottage/cabin, which includes a small deck. I may add an extension on the side 8′ x 20′ as well for pantry, utility etc. That sounds like something I would be interested in. i couldn’t take my eyes out of the PC unless i watched the 15 Videos, which has a lot of details and techniques, it is amazing successive videos which make anyone could build his own shed. i was browsing to build a small wooden home of one room Kitchenette, Toilet and out door Terra’s . please let me know if you have such designs to be purchased, also prefer that should have a videos. similar to shed video. thank you again for sharing your prof. knowledge. best luck and hope to see you soon in different projects. We are actually thinking of stepping things up a big notch and buying a rural property and doing a complete series of videos starting from property selection, then starting with a small cabin, a complete house and then all the outbuildings. In between, Mark will be doing videos on gardening, permaculture, beekeeping and lots of food related videos (he is a professional chef after all)… not sure if we can get that started this year, but it is “for sure” in the plans. Every video and plans will be as detailed as the shed videos. P.S. Some plans will be free, others that involve lots of work and video we will have to charge for (covers the time involved and materials – e.g. 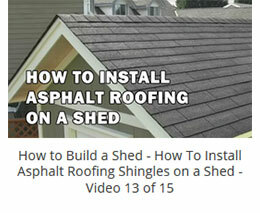 the shed videos took 550 clips to make the 15 videos on our site). Loved your videos. However, I’ve heard it’s better to use nails because they are more likely to bend as the frame expands and contracts throughout the seasons and screws would just break off. Should I go with screws or nails? I have never heard that before. Your framing would have to move and contract an awful lot to break construction screws. Imagine all the decks out there directly exposed to weather and screwed together, if this was an issue, North American building codes would outlaw the use of screws and Mike Holmes would be in serious trouble… he and his crew use screws all the time on Holmes on Homes. These days, screws are used in all aspects of construction and I am sure they are designed and made to withstand the stresses inherent in construction of buildings. If you are really concerned, check with your local building department. The only use of screws that can be an issue to the best of my knowledge is when you are using treated wood. If you do not use the correct coated screws for treated wood, the screws will corrode and eventually break! Just a quick update to all viewers… In some areas of framing and structural work, nails are required by building code – small sheds are not likely to be part of this, but larger buildings, homes etc would. Be sure to check with your local building inspector/department to make sure you comply with what is required for the project you have planned. I watched all of your videos. These were the most comprehensive and well put together videos I have ever seen. I wanted to thank you for helping me build my 10″ x 12′ shed. I took a lot of your ideas and modified my measurements to fit my application. They worked out great. Your techniques and self assisting jigs were invaluable. This was the first woodworking task of this magnitude I had tried and it turned out great. Your videos along with your tips were just what I needed. I am not a master carpenter but I can hold my own with wood projects and a few of your pointers sure did save me a lot of time and money. I only wish you would have built the shed door instead of using a pre-hung. I am at that point in the project and a little stuck on how to build the doors my self. ****I have never written a comment to anyone of the internet but I told my wife that you definitely deserve this comment and accolades. Job well done to you and your camera person and your editor. I look forward to watching any further projects you may post. P.S. I would also suggest allowing folks to post their projects after following your videos. I am really glad to hear the videos helped you that much… and thank you very much for the kind words. I would love to receive pictures and comments to post on the site. If you have some, please send them and I will figure out how to create a section on the site for these. If you would like to include a few words with the pics, that would be great too! I thought about building a door but we had time restraints and we also got a great deal on the door – $50 brand new (normally $150) so pre-hung it was. Camera Man is Mark Wilkie… He’ll be posting a video soon on Bee Keeping (he just completed a course and will post videos when he feels he can pass on what he has learned). Editing and plans on the shed were myself (and it is a lot of work and time – shed was 500 clips that made up the 15 videos). We are hoping to start a greenhouse series (any type of wood, any glazing, but one design – pretty cool) and a chicken coop. Tomorrow after work going for my second one. 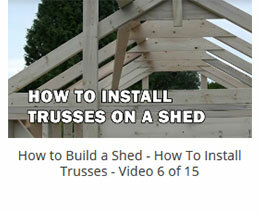 Check video #4 – it shows how the trusses are made. There are 15 videos in all. Henry, WoW! Amazing video series! My favorite shed build series on the web or billions of vids. My home has a 12×12 cement slab. The previous owner of my home took their shed when they moved. I already am a diy’er so this is very close to the top of my list. I could not do it as well; without this excellent video series. I just wanted to say, Thank you! Thanks Harry… Glad you enjoyed them and found them helpful. I always use hurricane ties. They are cheap and you only need a small amount so it is likely it will cost you less than $20 and they offer the piece of mind that the roof is securely connected to the walls. The shed you seen that you favour is actually 12′ x 12′ so it is fine to use that design. For that shed I used 2×6 rafters. What spacing you use and the type of wood is your choice and really depends on the building code in your area and weather conditions. I am not an engineer so I cannot say what is best for your application and location (if you are not sure, ask your local building inspector). The pitch was 7/12 but if you don’t get snow (or little) you may want to go to 4/12 which is easier and safer for application of roof sheathing and shingles (or other materials). If you start to change the measurements throughout the shed it will be very difficult for me to advise what is best to do since the changes associated will compound and effect many different aspects of the finished shed and details. You will have to watch the videos and see how each change you make will effect the following finish details. For example, if you increase the height, the smart side panels will likely not be high enough to use the same trim detail I provide etc etc. If you increase the width, the structural detail and construction of the trusses will need to be altered to compensate for the increase span. There is just to many things that will need to be modified so I cannot advise on this. I do not offer these videos on DVD or CD – Sorry. If I was to get enough requests I might consider providing these in the future. The plans are for a 8′ x 10′ shed (we found this to be the most popular size requested at building stores). I do not have plans for that size of shed as I actually create the plans from scratch (not automated software). Sorry I can’t help you out on either item. Glad to here you enjoyed the videos and I hope they help with your future projects. I have just checked the local legislations about building a shed and I have right to build a shed of max 40 m2 without a permit but I have to submit a written paper (sorry for my poor english).So no problem. I’m gonna try to build a 3 x 3 shed. Thank you for ideas. Hi Henry, thank you for reply. I have a question about the shed. 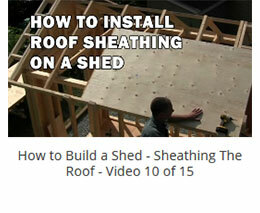 If i plan a 4m x 4m shed, what do i have to wachtout? Should i adjust 30° 60° angels and the tickness of the trusses for a strong roof? I am worried about the weather condition.I saw a 120km/h dewasteting wind down here. That is not easy to answer. This is closer to the size of a garage, and very likely will require building permits and plans. 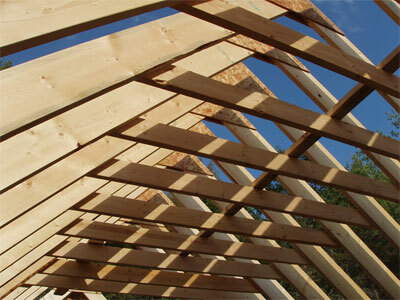 However the main changes would be in the floor joists and how you plan to support these, and the rafters (or trusses). When you get into larger structures like this, snow loads and weather conditions (and resistance) are very important. So I really can’t advise on this, other than to recommend checking with your local building department and finding out what is required. In most areas of the USA and Canada, anything over 120 sq ft requires a permit so you will likely be talking to them anyways. In Europe I believe there are even more restrictions (in the cities anyways). DIY trusses for small shed is usually not an issue since you really can’t go much smaller than 2×4’s and spans seldom exceed 8′ (and in most cases, no one is living or sleeping in them). I am from Belgium and i watched your exellent videos over the shed. No doubt, jou are a pro. Thank you for sharing your valuable knowledge with us. Thank you Kemal, Glad you enjoyed them. Sorry, Carport isn’t in the plans yet. Next project will be in the spring after the snow melts. Either a greenhouse or chicken coop, not sure which one will be done first. Overall width is 9′ 10″ – make it 10′ wide to be safe.